TRANQUILITY BASE is a beautiful 2006 model Krogen 48' North Sea Widebody that is ready for your adventures. While currently in Australia, the price includes shipping to North American port! She in excellent condition and expertly equipped and maintained, reflecting the proud heritage of the trawler-inspired Kadey-Krogen fleet. TRANQUILITY BASE is hull number 33 of the 49 Krogen 48 North Sea boats built.She is turn-key in every respect having just returned from a long term, long range East Coast Australia cruise.Her tasteful decor and exceptional accomodations make her a perfect candidate to long range cruising and/or living aboard. United Yacht Sales New Jersey would love to guide you through a personal showing of this 48' Krogen 48 North Sea 2006. This yacht for sale is located in Unknown Australia and priced at $695,000. For a showing please contact us by filling out the form on this page and we will get back to you shortly! 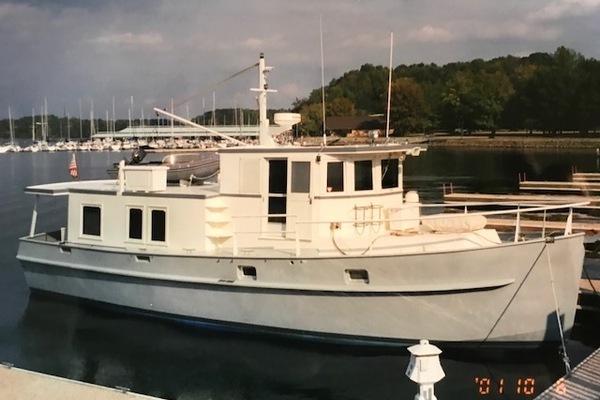 The current owner has replaced all incandescant light bulbs with LED bulbs, except for the engine room lights and spreader lights on the mast. The navigation computer has been replaced with a new laptop and new MaxSea software. A new Raymarine C125GPS chartplotter has been fitted on the flybridge. A new Force 10 gas stove and oven was fitted upon her arrival in Australia, to comply with Australian gas certification regulations with regard to flame-outs. The owner has also fitted a new 316 stainless steel trim to the flybridge windscreen, as well as a 240v/120v transformer for shore power use in Australia. New Sureflo deckwash pump recently fitted. A new 270 amp alternator has been fitted to the engine.There is not enough room to list the vast quantity of spares that are included in the purchase price of TRANQUILITY BASE, but to list a few:Reconditioned Balmar 270 Amp Alternator.Brand new fresh water pump.Brand New Raw water pump for main Engine.Spare Fortress Anchor.Safe to say, she is fully equipped and ready to depart to any destination of your choosing at a moment's notice.TRANQUILITY BASE has all the components and systems you would expect on a proper passage maker, and all the necessities for luxurious and comfortable living.THE KROGEN 48' NORTH SEA - A HISTORYThe Krogen 48' North Sea was and is a masterpiece that so furthered the legacy of the groundbreaking Krogen 42' that she very often is the choice of retiring professional mariners, naval architects, experienced transoceanic voyagers and circumnavigators, and even those new to the cruising lifestyle. These owners know that the Krogen 48' North Sea is a ruggedly capable yet comfortably liveable trawler yacht that has logged countless voyages both to far-flung ports and those close to home.If you encounter the Krogen 48' North Sea near your docks, strike up a conversation with the owner or crew. Chances are you'll find an interesting person with seagoing knowledge and experience, and great confidence and pride in this vessel. 49 examples of the Krogen 48' North Sea were built between 1995 - 2010. Her USCG documentation number is 1180294 with her original hailing port being Minneapolis, Minnesota. TRANQUILITY BASE was fully imported into Australia in 2014.Boat Name: TRANQUILITY BASEMake: KrogenModel: 48' North Sea WidebodyHull Shape: Full DisplacementYear: 2006Price: POAModel Length: 48 ftBeam: 17 ft 4 inDraft: 5 ftLocation: Sydney, NSW AustraliaMEASUREMENTSLength Overall: 16.15 m - 53 ftLength at Waterline: 13.84 m - 45 ft 5 inLength on Deck: 14.78 m - 48 ft 6 inBeam: 5.28 m - 17 ft 4 inMaximum Draft: 1.52 m - 5 ftBallast: 2045 kgs - 4500 lbDisplacement: 25,660 kgs - 56,450 lbFuel Tanks Capacity: 3785 litres - 1000 US gallons - in 3 tanks.Fuel Tanks Material: AluminiumFresh Water Tanks Capacity: 1514 litres - 400 US gallons. 12vDC Headhunter X-Caliber pump.Fresh Water Tanks Material: 316 Stainless SteelHolding Tank Capacity: 378 litres - 100 US gallonsHolding Tanks Material: GRPPROPULSIONNumber of Engines: 1Primary Engines: InboardDrive Type: Direct DriveEngine Make: John DeereEngine Model: 6068TFM50Engine Year: 2006Engine Hours: 2913 hoursTotal Power: 225 hp @ 2600 rpmCruising Speed: 8 knotsCruising Speed RPM: 1800Cruising Range:1450 nautical miles @ 9 knots2000 nautical miles @ 8 knots2550 nautical miles @ 7 knots3000 nautical miles @ 5 knotsENGINE PERFORMANCE - Recorded engine performance and average speed (November 2013)8.3 knots @ 1800 rpm8.8 knots @ 2200 rpm9.4 knots @ 2700 rpmAFT DECK AND SALOONThe aft deck is fully covered. There is also a wing door to deflect the elements on the starboard side when seated on the aft deck. The saloon is entered through double welded aluminum weather tight doors. To starboard is an L-shaped Ultra-Leather© settee with a hi-lo table that serves as a coffee/cocktail table or that expands to a large dining table.Forward of the settee is an end cabinet and entertainment center that houses a new Palsonic TV and Bose sound system. To port are two new Leather Lazyboy Recliner Rocker chairs, a server cabinet that houses an ice-maker and book shelves. There are large opening windows port and starboard as well as an opening window in the aft bulkhead.GALLEYThe open faced galley is forward of the saloon on the starboard side. It features abundant work and storage space, Corian© countertops, GE© full-size refrigerator/freezer, GE© trash compactor, GE© convection microwave oven, near new (2014) Force 10© 3 burner LPG stove with oven, Seagull© water purification system, Raritan© ice maker and a large stainless steel sink.MASTER STATEROOMThe master stateroom is forward and has a queen-size island berth with custom mattress. There are 4 stainless steel opening ports and 2 overhead hatches giving plenty of light and ventilation. Storage is abundant. There are 3 hanging lockers, 12 large drawers plus a large compartment under the berth. There is also an en suite head with Vaccuflush fresh water toilet, stall shower with molded seat and a mirrored vanity with medicine cabinet.OFFICE/GUEST STATEROOMAft of the master stateroom and on the starboard side is the very comfortable office/guest stateroom. There is a large L-shaped settee that converts to a very large double berth. There is also a lighted teak bookshelf, a large desk and a hanging locker along with 3 stainless steel opening ports. This is the perfect spot to curl up with your favorite book or just spend some quiet time.GUEST HEADThe guest head is opposite the office/guest stateroom. These is a Vaccuflush fresh water head, stall shower and mirrored vanity. The guest head also houses the stack washer and dryer.PILOTHOUSEForward and up from the saloon/galley area is the raised pilothouse, the operations centre of TRANQUILITY BASE. Here you will find everything necessary for safe and efficient piloting, and all within easy reach of the helm. The captain will enjoy the Ultra-Leather© Stidd helm seat while guests sit comfortably on the L-shaped Ultra-Leather© settee. The settee also converts to a double berth when needed.There are welded aluminum Dutch weather tight doors port and starboard providing easy access to the side decks and boat deck. Additional light and ventilation are provided by 2 overhead hatchs, large opening windows port and starboard and 2 stainless steel opening ports in the aft bulkhead.MECHANICAL AND ENGINE ROOMTRAC hydraulic stabilizers.ABT 12 hp 24V bow thruster with dedicated batteries and charger.Automatic fire suppression system.Racor fuel filters for main engine and generator.Fuel polishing system.Oil change system.Spectra Newport 400 watermaker with auto flush.ADDITIONAL COMPONENTSCruisAir 4 zone reverse cycle air conditioning.11' AB Aluminium hull inflatable with 15 hp Yamaha 2-stroke outboard (2016).Nautical Structures MC800 360 kgs/800lb electric davit on port aft flybridge deck.Mast, boom and tabernacle on forward boat deck.7 x Opening side portlights/portholes to port. Rectangular and circular.7 x Opening side portlights/portholes to starboard. Rectangular and circular.2 x Opening portlights in forward lower flybridge.2 x Lewmar hatches located on fore-deck.2 x Lewmar hatches located above the Pilothouse.4 x Corner line hawse pipes at transom/cockpit.1 x Hawse pipe starboard amidships.2 x Hawse pipes at the bow.2 x Hawse pipes at forward chain locker.Maxwell HWC-2200 12v anchor windlass.Rocna 55kgs/120lb galvanised anchor with 300' 11mm/5/8" G4 galvanised anchor chain. Re-galvanised 2017.Full canvas including bimini, cushions and flybridge cover.Near new carpeting throughout.Teak aft deck furniture.316 stainless steel BBQ. (2016)316 stainless steel bait board. (2016)316 stainless steeel rod holders. (2016)ELECTRONICSFuruno NAVnet vx2 Multi-Functional Navigational Display, with Nautcomp 15" monitor, 64 mile radar, GPS Chartplotter, Network Sounder and Raymarine Stern Camera.Raymarine C125GPS chartplotter on flybridge.Simrad AP25 autopilot with AP26 flybridge repeater.Laptop navigation computer with MaxSea navigation software (2016).Standard Horizon Quantum GX2360S VHF radio with RAM microphones pilothouse and flybridge.Icom IC-M802 Single Side Band radio.Raymarine ST-60 depth, speed and log with flybridge remote.Raymarine ST-60 wind.Danforth Constellation 6" & 4" compasses.Weatherfax.XM Satellite weather.SkyMate satellite communication.Weems & Plath Barometer.Weems & Plath Ships Clock.KVH 3 satellite TV antenna (no satellite TV box fitted).Palsonic TV in saloon.XM Satellite radio (non-operational).ELECTRICAL12/24/120v system with 240v transformer for shore supply.12 Kw 120/240v Northern Lights generator with sound shield (1221 hours).270 amp alternator (2016).Xantrex 3000 watt inverter/charger.Glendinning Cablemaster.Galvanic isolators.1 x 12v Lifeline 8D AGM Engine start battery (new 2016).1 x 12v Lifeline Group 31 AGM Generator start battery (new 11/2012).4 x 12v Lifeline 8D AGM House / Inverter batteries (new 11/2012).2 x 12v Lifeline 8D AGM Bow thruster batteries (new 2014).24v charger for bow thruster batteries.EXCLUSIONSOwners' personal items and art work do not convey.